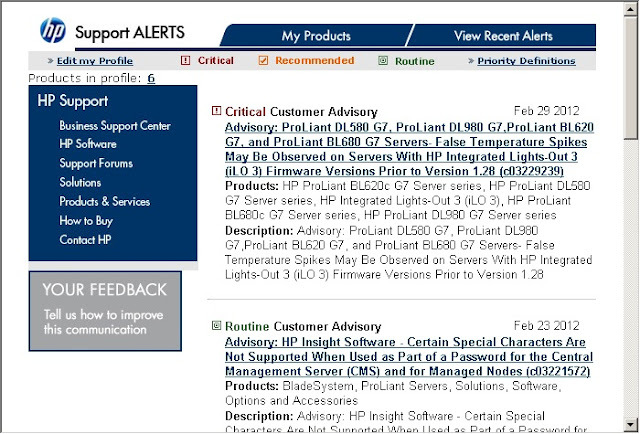 I often complain about the hp.com web pages and how challenging it is to find the right information there. And this is a pity, because there really is quite a lot of important and useful information available here, e.g. regarding BIOS, firmware and driver updates for the HP hardware that you are using and advisories about known problems and how to avoid or fix them. So it is good to know that you can actually subscribe to this information and have e-mails sent to you whenever there are important updates or alerts for your hardware. Click on the Subscriber's choice for business log in page to register for and configure this service. If you already have an account with HP you can directly sign in with it, otherwise click on the "Register" button and create a new account (It's free and just requires a valid email address). I recommend that you carefully think about what HP hardware components you use and want to add here. If e.g. you are using c7000 blade enclosures with BL620c G7 servers then add every single component that has its own firmware and/or drivers: the BL620s, but also their iLO boards and CNAs, the enclosure, Onboard Administrator and Virtual Connect modules (see picture). 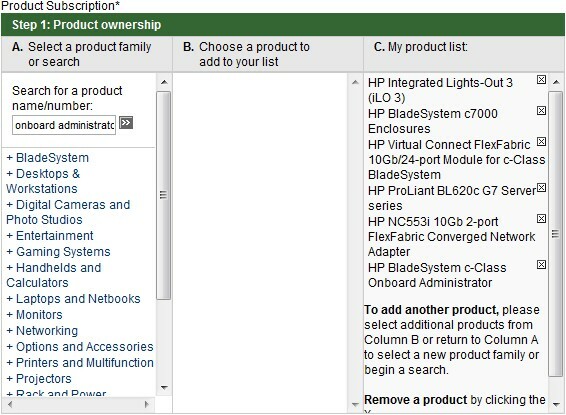 Add this list for any type of HP server model you have. In the next steps you choose how often and in which format (HTML or text e-mail or RSS feed) you want to receive the alerts and what operating systems you are interested in. Highly recommended to pro-actively inform yourself about possible hardware problems (and there is a plenty of them)! Watch out: ESXi 6.0 introduces root account lockout! [Release] vSphere 5.0 Update 1 etc.